The 2018 Victorian Architecture Awards, held Friday July 29 awarded Bunjil Place the William Wardell Award for Public Architecture. Bunjil Place is the largest project ever undertaken by a local government in Victoria, comprising Council offices, an 800 seat theatre, 200 seat black box studio, public library, art gallery and function centre, all centred around a new community plaza with integrated cafe, urban screen and war memorial, as well as a community amphitheatre. 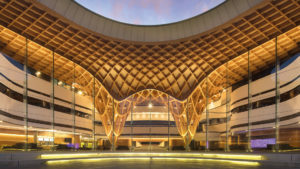 The Jury noted that Bunjil Place was “a highly aspirational project” with a foyer roof in which timber has been used “in a monumental way”. “The expressive roof form energetically soars over a myriad of programmatic requirements cleverly providing shelter, identity and unity with this one move,” they wrote. Amy Muir, Victorian chapter president, said the winning projects of the night represented the diversity of work being completed across the state. We wish to congratulate the City of Casey for their aspirational brief and long term collaboration throughout the project; contractor, Multiplex; and all consultants involved. 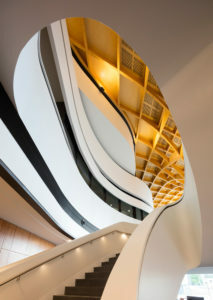 Bunjil Place now progresses to the shortlist for the National Architecture Awards, to be announced in November.